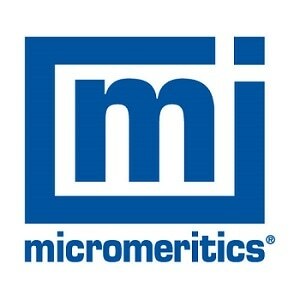 As an analytical instrument manufacturer, Micromeritics relentlessly pursues the goal of producing instruments that achieve the highest level of accuracy and precision attainable. This holds true for our density measuring instruments, except for an interesting anomaly: with envelope density and bulk density analyses of granular and other irregular small objects, results can depend on the way the sample’s volume is defined. A material’s envelope density is its mass divided by its volume when volume is determined including that of pore spaces within the material. Bulk density also is defined as material mass divided by volume, but the volume is that into which the mass of material may be confined. In other words, this volume includes interstitial (or void) spaces among the objects, as well as pore spaces inside the objects. From such measurements, Micromeritics’ GeoPyc 1365 can determine envelope density and bulk density, as well as other data, such as percent porosity. Envelope density assessment requires that a critical distinction be made of where surface irregularity or roughness ends, and where internal porosity begins. Envelope density results always depend on the classification of void spaces as either pores or surface irregularities. 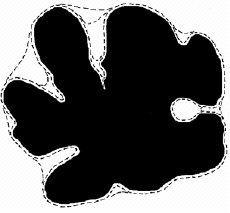 Consider, for example, the illustration below, which depicts a two-dimensional cross-section of a typical sample object that is both porous and irregular in shape. In Figure 1, the dotted lines represent several equally-defensible, albeit arbitrary, definitions of which openings are pore entrances and which are surface irregularities. Various methods for determining envelope density employ differing definitions. Each definition results in a different volume measurement for the sample, so the resulting density values vary as well. 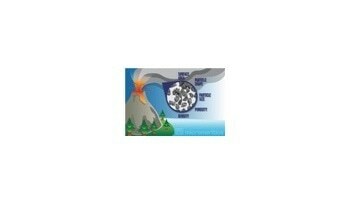 During GeoPyc analysis, the volume of a quantity of a fine, dry, free-flowing powder, called DryFlo, is measured. The sample then is immersed in the DryFlo, and the displacement volume of the sample is measured. Because DryFlo conforms to surface irregularities much as a liquid would, but does not enter the smallest pores (with entrance diameters smaller than approximately 25 microns), the volume of irregularly shaped or even multi-piece samples can be measured, and their density and porosity can be calculated. Analysis is quick and quiet, and it is generally non-destructive of the sample. Bulk density measurements again vary with the conditions under which the sample’s volume is measured. For example, a pail of dry sand may appear full, but its contents may settle when shaken, allowing the addition of more sand. In general, the more vigorously the pail is shaken, the tighter the sand is packed, and the more sand the pail can contain. Similarly, a tall column of a fine powder, such as baking flour, packs more tightly when vibrated than a short column does, due to the weight of the flour above in the tall column. Here, the height of the column, the intensity of the vibration, and the duration of vibration are all critically important in defining the test. Any variation in one or more of these variables may alter results significantly. The settling characteristics of a material are useful in packaging and shipping a wide variety of products. For this purpose, bulk density sometimes is determined using the “tap” method, in which the sample is placed in a graduated cylinder and vigorously tapped on a surface a pre-determined number of times. The result varies depending upon the number of taps and the intensity of the tapping. No control is exercised over the degree to which the sample is compacted, so results may not be repeatable. 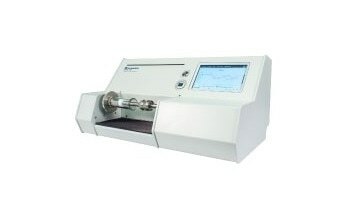 Rather than compacting the sample by tapping, Micromeritics’ GeoPyc consolidates it within the sample chamber until a specified force is achieved. The force is measured accurately, and it is verifiable; results are highly repeatable. The volume is measured at the specified degree of compaction, and calculations yield the material’s bulk density under the force applied. The GeoPyc is unique in that it provides the user the choice of determining density results empirically, or adjusting an input variable to account for any difference between the method by which the sample volume was obtained by the GeoPyc versus a previous method. In the case of envelope density, agreement with another method of measuring sample volume is achieved by calibration with a sample evaluated by the other technique. Simply perform a calibration run with the GeoPyc, using as the sample a material evaluated under the other procedure. When prompted, enter the value from the other procedure. Thereafter (or until instructed otherwise) the instrument adjusts its calculations to account for the difference in the volume measurement methods. For bulk density results to agree with those obtained by another method of measurement, analysis should be performed using a consolidation force that results in the same degree of consolidation that was used in the previous method. To discover this force, the operator simply performs a few tests using various forces. The force that yields data duplicating previous data should be used for subsequent analyses with the GeoPyc, providing excellent control over the degree of sample compaction and repeatability of results.